This new chess variant involves a very powerful new piece, the Snake. 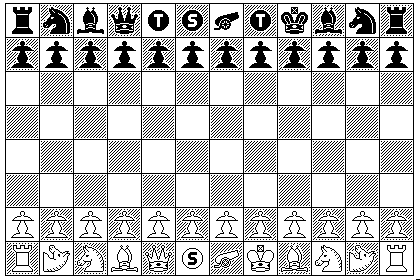 In his novel The Chessmen of Mars, Edgar Rice Burroughs described the Martian game of chess, Jetan, in which one could win either by capturing the opponent's Princess (with any piece), or by capturing the opponent's Chief with your own Chief; if you captured the opponent's Chief with any other of your pieces, the game was drawn. While this rule was useful to create suspense in the game of Jetan described in the novel, in practice one would expect it to lead to nearly every game of Jetan being a draw in response to one or the other Chief cutting a swath through the opponent's pieces. Even if this was avoided on Barsoom because the people there were a warrior race that disdained draws, it would still be the case among the pragmatic chessplayers of Earth, who formed a receptive audience for the works of Steinitz. The Snake is a piece with a limited immunity to capture, and a short-range move, in an attempt to provide a more balanced piece of this general type. The diagram above shows the first of three basic board layouts for this version of the game. The Camel has a move similar to that of the Knight, except that it is more elongated; a displacement of one square in one direction, and three squares in a perpendicular direction. Thus, like the Bishop, the Camel always stays on squares of only one color. The Cannon moves like the corresponding piece in Chinese Chess; it moves, but does not capture, like a Rook; it captures on Rook lines, but there must be exactly one other piece between the Cannon and the piece the Cannon will capture by moving to its square. Before the move of the Snake can be described, the way in which pawn promotion is changed in this variant must be explained. When a Pawn moves to the last rank, it may be promoted immediately in the conventional manner found in normal Chess, but only to a Knight. If it is not promoted, but left on the last rank, then on a subsequent turn, it may be moved forwards again, off the board. When this is done, the player to whom that Pawn belongs must promote one of his other Pawns to a Man. If a Pawn is sitting on the last rank of the board, waiting to be moved off the board, and the player has no other Pawns, that Pawn must be removed from the board. When a Man is moved to the first rank of the board, it may be promoted to any piece except a Pawn, a King, or a Snake. If it is not promoted at that time, it may not be promoted on a later turn while it is sitting on the back rank, but if it is moved off the back rank, it can again be promoted whenever it is moved to the back rank again. Now, the move of the Snake can be described. The Snake moves, but does not capture, one square diagonally. The Snake captures, but does not move without capturing, one square orthogonally. The Snake is immune to capture, with four exceptions. The Snake can be captured by the opposing King. Thus, it can either cut a swath through the opposing player's pieces, or draw the King out of hiding. The Snake can be captured by any opposing Pawn. Thus, the Pawn structure of Pawns defending one another remains relevant. Since Pawns have limited mobility, and can't move backwards, presumably a Snake should otherwise be able to avoid them. The Snake can be captured by the opponent's Snake: and a Snake can capture another Snake by moving one space diagonally in addition to doing so by moving one space orthogonally. In this way, a Snake can be used to protect pieces against being captured by the opponent's Snake, even when the two Snakes are on squares of opposite colors. The Snake can be captured by a Man belonging to the opponent. Thus, the new pawn promotion rule provides one other effective way to capture the opponent's Snake without moving one's King out of a secure position. If neither player has a Snake on the board, Pawns may now be promoted to any piece except a Snake (or a Pawn or King) conventionally, not just a Knight; they may still not be promoted, and used to promote another Pawn to a Man, as well; and Men may still be promoted by being moved to the first rank. In this way, Pawn promotion still functions normally in the endgame. The Tiger moves, but does not capture, like a Bishop, and captures, but does not move, like a Knight. Since a Tiger has the power of a minor piece, but a Camel is less powerful than a normal minor piece, Black has the advantage in this variant. To mitigate this somewhat, White makes two moves, one after the other, on his first turn. Dynamic Scoring is used with this game. In the case of the asymmetrical variant, since Black has the advantage, it is White, not Black, that scores more for partial victories. The intent of having the asymmetrical variant is so that if two players are very evenly matched and play defensively, there will still be some games that, due to the larger advantage provided to Black in the asymmetrical variant, that will not be draws. and then the sequence repeats. Thus, the player who played White in the first game will alternate between being the first player to play White in the two games played with the asymmetrical variant and being the first player to play Black in a pair of successive games played with the asymmetrical variant. In order to maintain this alternation, the asymmetrical variant, Variant 3, is played in games 5 and 6, or 4 and 5, or 3 and 4, or 2 and 3, of a group of 6 games, but not in games 1 and 2 of such a group. 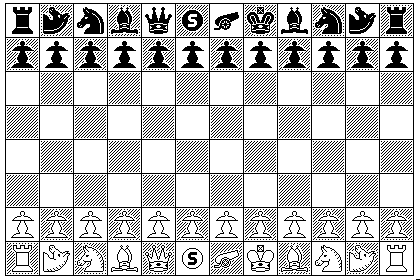 In the alternative rule for Snake Chess, Pawn promotion is always conventional, and the Man never appears on the chessboard. The Snake can be captured in the conventional fashion by replacement by a Pawn or a King, so two of the three other exceptions to its immunity from capture still apply. However, there is also one additional to capture a Snake. Any piece, except a Pawn or King, can capture a Snake, but not by replacement - instead, other pieces may capture a snake by custodian capture. This capture may be along orthogonal or diagonal lines. Thus, when the opponent's Snake is adjacent to one of your own pieces, you may capture that Snake by moving a piece of yours to the square that is exactly on the opposite side of the Snake from that piece of yours. Note that a Snake may move itself between two of your pieces without being captured thereby. This form of capture is more difficult to arrange than replacement capture, sufficiently so that the Snake is still a powerful and threatening piece, but since it can be carried out by almost any piece, the difficulty of capturing a Snake is reduced to what may be a more reasonable level.